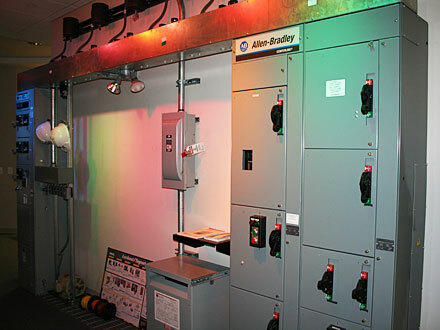 The industrial motor control center features a 3 cubicle M.C.C, a 3 phase 208V to 480V step-up transformer, and 5 motors. All the cubicles have handsoff-auto switches and start/stop buttons. One cubicle provides a variable frequency drive and forward/reversing control of one of the 5 motors.